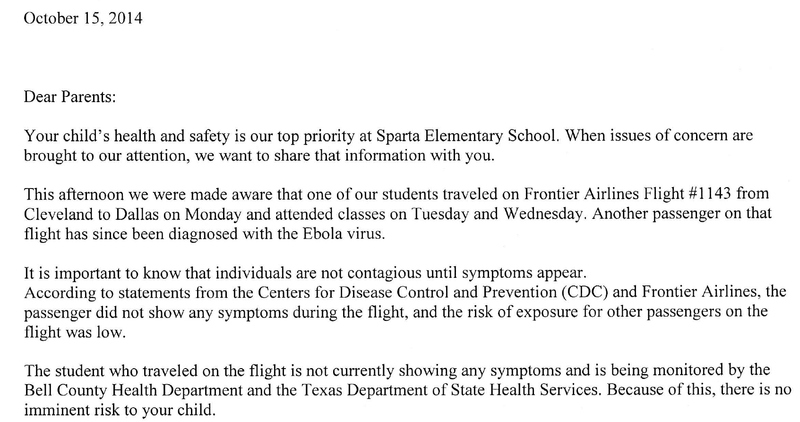 Three schools in the Belton School District in Texas have closed after discovering that students had been exposed to the second Ebola victim on the same Frontier airlines flight. Statements originally were sent to parents about the exposure yesterday, but eventually they elected to close down the schools after the CDC “re-evaluated” the health risk to other passengers. It really does seem like these kids are at minimal risk, but I don’t blame the parents for being alarmed. Even if the nurse was contagious, which it doesn’t appear she was, it would be really tough to think she’d be able to infect an entire plane. But because of the extreme nature of Ebola, the schools have to take extra precautions. Unless Ebola has mutated, and it’s more contagious than we thought.